Zoe Gibson is a peer support worker with Kent and Medway NHS and Social Care Partnership Trust’s (KMPT) Rosewood Mother and Baby Unit (MBU). Following my own events, I am driven by an intense desire to help and support others who are also experiencing the thunderbolt and subsequent devastation acute perinatal mental illness can leave behind. I am proud to be working as a peer support worker at Rosewood MBU and to share my story to help other mothers open up about their own mental health. At 30 weeks pregnant, my mind suddenly attacked me. I was stressed and anxious, and rapidly descended into chronic depression. My mental illness was torture and stripped me of my personality and ability to function. I constantly battled terrifying delusions, suicidal thoughts, and suffered guilt and shame. Following my son’s birth, I felt like a ghost and remember thinking that I could die now that my baby had arrived safely. This horrifying experience was not what my husband and I had envisaged when we decided to start a family. It felt like a cruelly twisted version that was completely out of our control. Thankfully I had excellent support and treatment from KMPT and South London and Maudsley NHS Foundation Trust’s (SLAM) MBU where I stayed for five months with my son. I then decided to use my lived experience to help others and support the launch of a new MBU in my area. I joined KMPT’s MBU Project Board as a volunteer and provided a patient voice and perspective on a range of key areas such as design, furnishings, policies, recruitment, engagement and communications. To promote the great work of the new MBU, I spoke about my experience publicly for the first time, along with another service user, Tee Nixon. This involved media interviews and delivering presentations at conferences. This was a daunting experience for us at first but we were united in our motivation to help other women by sharing our stories. The result has been incredibly positive. After hearing our stories, people started to confide in us about their own experiences of perinatal mental illness. We heard how our stories had encouraged other mums to seek professional help and provided reassurance that things can get better. The real power of peer support! Peer support was the one thing that I felt was missing from my care when I was unwell. I still remember feeling desperate for evidence that women who had been admitted to an MBU had got better. I longed to have access to someone who could offer comfort with a true understanding of what I was going through and could answer the questions that were constantly whizzing round my head, causing me so much anxiety. This is why I feel very privileged to now be a peer support worker. Across mental health services, peer support workers are a symbol of hope, showing patients and their relatives that recovery is possible. We work side by-side with them to listen, support and encourage them in their recovery. The power of mutual understanding is incredible. Patients have given feedback that support from staff with lived experience has been invaluable. As a peer support worker I have a dual perspective as a professional and service user. We provide an authentic account of how continued efforts are required to maintain long-term well-being and recovery. A key part of this role is to carry the patient voice across the MBU. We are present at admission, discharge, handover, ward rounds, case reviews, training sessions and staff meetings and act as the patients’ advocates. We also act as positive role models and highlight that people affected by mental illness have a valuable contribution to make as members of a perinatal mental health team. This has been demonstrated right from the birth of Rosewood MBU with the success of its co-production, and I think the peer voice should be fundamentally embedded in the continued development of all aspects of the MBU to achieve maximum benefits for everyone. 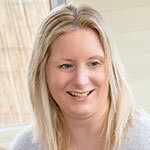 Zoe Gibson is a mother-of-two and part-time peer support worker (PSW) at KMPT’s Rosewood MBU in Dartford. Prior to her PSW role Zoe was an English for Foreign Language teacher and service user representative on KMPT’s MBU project development board. Zoe has also spoken at various events including the Kent and Medway Sustainability and Transformation Partnership (STP) mental health conference. She lives with her husband and sons, Harry and Jack in Canterbury, Kent. I have worked in mental health for 22 years and have worked in a high secure hospital. I would love the opportunity to be a peer support worker how do I go about being one? A great read. A very descriptive account of your own experience. While it was difficult to read about what you have been through, it’s amazing how you have used your own experience to positively change other people’s experiences whilst also increasing awareness about support and services available. Excellent blog, demonstrates the importance of peer support. We all need to work together to enable the swift recovery of mothers and peer supporters (Sparklers) can definitely help. Fantastic. I would love to be able to do this as I too really felt if I’d had some hope that things would get better then I might not have become so poorly.